Do you remember what kind of sneaker you wore in grade school, middle school, or high school? 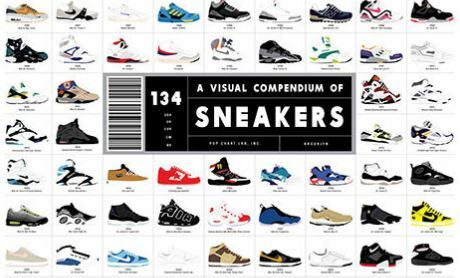 Now you can revisit your youth by perusing the history of the sneaker infographic. Talk about nostalgia! Do those KangaROOS look familiar? Or perhaps the Reebok Shaq Attacks? The shoe-wear infographic can be found on the Pop Chart Lab website (www.popchartlab.com) and features 134 meticulously illustrated sneakers—ranging from Converse Chuck Taylor’s to Adidas, to Air Jordan’s. 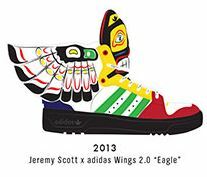 Not only can you find classic Nike, Puma, and Adidas styles, you can also find some seriously unique models like this wild, and perhaps controversial, 2013 Jeremy Scott Adidas Wings model—definitely not the typical sneaker. Each print is signed by the artists and numbered from a first printing of 500, and comes packaged in a custom Pop Chart Lab Test Tube. Tags: creative design sneaker history cool. Bookmark the permalink. That is so funny! and fun!